Myth Busted: TARP Will NOT Deliver Positive Returns! The Troubled Asset Relief Program (TARP) is a program initiated by the US government, funded by taxpayers, in October 2008 to bail out the banking and housing sector after the 2008 financial crisis. Due to the program’s complexity and “repayment” schemes, there has been different estimates of what TARP would ultimately cost. “It is a widely held misconception that TARP will make a profit.….. As of March 31, 2012, $470.1 billion is obligated to TARP programs.6 Of that amount, $414.6 billion had been spent and $50.2 billion remained obligated and available to be spent. Taxpayers are owed $118.5 billion as of March 31, 2012. 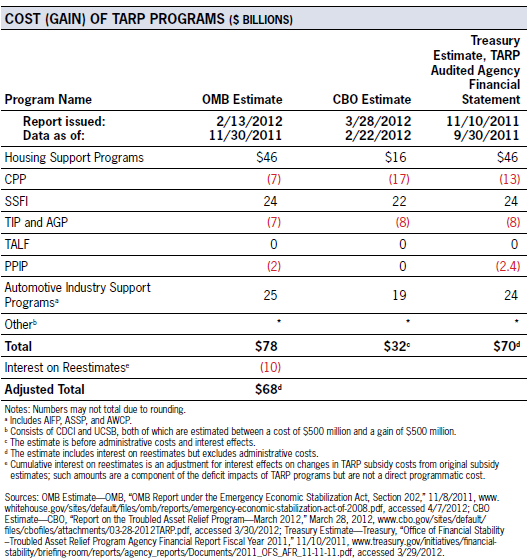 The table below from SIGTARP report lists the most recent TARP program estimates from three agencies. The update from Pro Publica, which tracks both the broader $700 billion TARP bill and the separate bailout of Fannie Mae and Freddie Mac, showed $225 billion is the net still outstanding as of Apr. 18, 2012. The tally from NYT stile as of April 28 came to $329.3 billion of fund not returned. CNNMoney data suggests $356.2 billion “invested” within TARP, and $118.5 billion paid back, leaving 237.7 billion still outstanding. Nevertheless, don’t think the buck stops here–SIGTARP report indicated $50.2 billion of TARP funds remain available as of March 31, 2012 to be drawn down by TARP recipients under three of TARP’s 13 announced programs mainly supporting banking, housing and auto sectors. That means the $118.5 billion TARP loss concluded by SIGTARP could get even worse as more fund is still to be disbursed. So it is fair to say regardless of the assumptions, it’d be hard pressed for TARP to break even let along turning a profit. If we count the other programs such as the Fed’s $1.2 trillion secret loan to Wall Street, the likelihood is quite small that U.S. taxpayers would ever come out of this hole dug so deep by the banking crisis and the subsequent secret and not-so-secret bailouts. Sadly, it looks like the 99% will likely have more than just one lost decade in the course of bailing out the 1%.